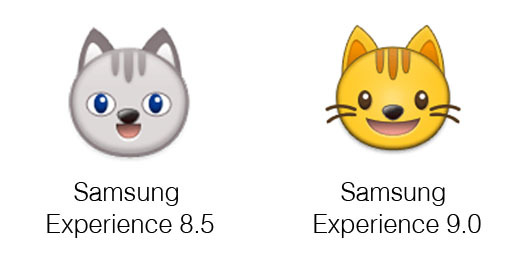 Less cross-platform confusion is in our emoji futures, as Samsung’s 🙄 rolling eyes emoji will soon represent the disdain shown on other manufacturers’ devices instead of its current pleased, somewhat expectant expression. Additionally, 😱 Face Screaming in Fear will look more Munch than anime demise and 💃 Woman Dancing is more poised and elegant than the current sneaker-stomp. 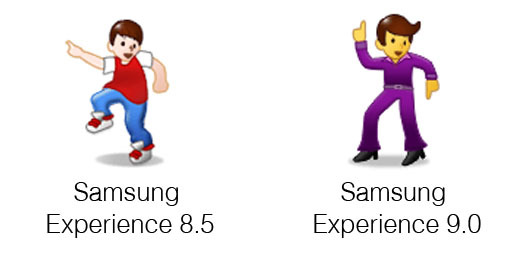 Coming as part of Samsung Experience 9.0 which begins rolling out now, this new emoji release will bring many of Samsung’s notoriously divergent designs much more in line with those of other vendors. 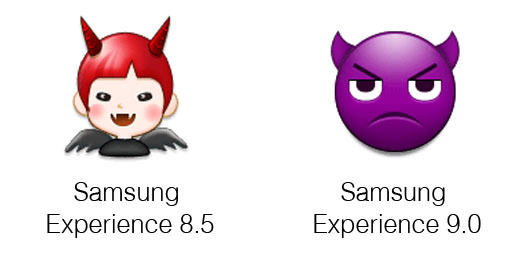 Above: Samsung's previous rolling eyes emoji presented a very different meaning compared to all other vendors. In doing so, almost all the facial expressions have undergone at least minor revisions (farewell, artful tilt) and a large number of other tweaks large and small have been made across the wider icon set. North of a thousand design modifications have been made: some major, some minor and some so misicule they're near invisible to the human eye. 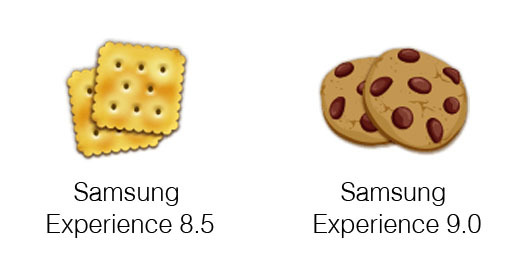 Additionally, 239 brand new emojis (including gender and skin tone variants) have been added within the update, brining Samsung device’s emoji offering in line with March 2017’s Emoji 5.0. 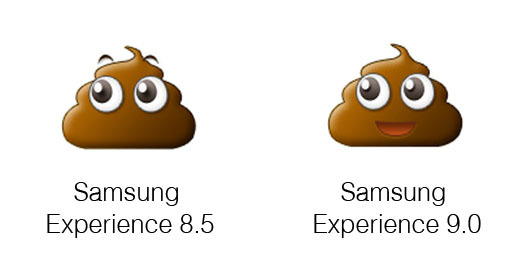 Samsung are the last major vendor to unveil their incarnations of the Emoji 5.0 icons. This updated included 9 new facial emojis, including 🤩 Star-Struck, 🤯 Exploding Head and 🤬 Face With Symbols on Mouth. It also featured several gender neutral icons for 🧒 Child, 🧑 Adult and 🧓 Older Adult, while also providing a male 🧔 Bearded Person as well as a woman 🤱 Breast-Feeding and a 🧕 Woman With Headscarf. 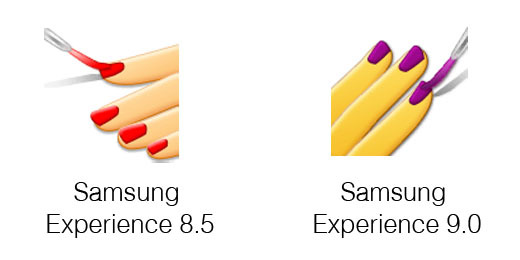 Take note of their skin tone also: with Samsung Experience 9.0, Samsung is now setting their default emoji skin for people and their associated limns to the cartoonish yellow recommended by Unicode and seen as standard across other vendors. Emoji 5.0 also of course introduced a wide set of fantasy creatures such as 🧚 Fairies, 🧟 Zombies, 🧛 Vampires and 🧜 Merpeople, each with a male and female variation. Other new across the other categories include 🧠 Brain, 🦒 Giraffe, 🥪 Sandwich, 🥧 Pie (showing just its crust, meaning it could be either sweet or savoury), and quite possibly the cutest incarnations of two new dinosaur emojis, 🦕 Sauropod and 🦖 T-Rex. 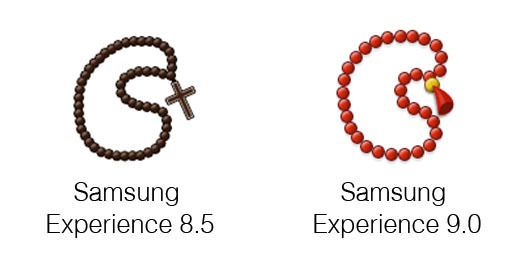 As I indicated earlier, there has clearly been a conscious effort from Samsung to more away from their "unique emoji suite" and make their designs converge with those of the other major vendors. This has had a sizable effect on more facial expressions than just 🙄 Face With Rolling Eyes and 😱 Face Screaming in Fear: 😬 Grimacing Face and 😫 Tired Face have lost their anime flair, while 😋 Face Savoring Food, 😏 Smirking Face and 🤤 Drooling Face have changed substantially enough to have their intended meanings made clearer. Other faces have also had their tilt removed, facing directly forward as opposed to being slightly pivoted, with additional icon-specific changes also being made. These include emoji MVPs 😂 Face With Tears of Joy, now with the standard two large tears as opposed to four small ones, and 😍 Smiling Face With Heart-Eyes, the latter of which no longer looks bowelled over in ecstasy. All of the "kissing faces" have also been tweaked to removing the little heart icon by the mouth where it didn't appear for other vendors, allowing a non-intimate whistling connotation across platforms for at least the non-winking variant. The tongue-sticking-out faces have also been brought in line, with the eyes made less watery and their blushing cheeks removed. Other faces have had small but noticeable edits, such as those visible on 🤑 Money-Mouth Face, 🤢 Nauseated Face and 🤐 Zipper-Mouth Face. And, as was mentioned when looking at the new Emoji 5.0 humans, all people and body part icons now default to the "Simpsons yellow" skin tone. This of course includes the hand gestures, some of which are shown below. As well as this, almost all of the human icons (including occupations) have been tweaked. Some examples are shown below, including a much less sinister 🕵️ Detective and David Bowie-inspired 👨‍🎤 Man Singer and 👩‍🎤 Woman Singer icons. In regards the non-human characters, there are several noteworthy changes. Firstly, all of the cat faces are now a yellowish colour and have black cartoon eyes as opposed to their previous grey fur and blue eyes combo. 😺 Grinning Cat Face is shown as an example below. And the ever-popular 💩 Pile of Poo now has a smiling mouth to go alongside its eyes (although its eyebrows have vanished)! Making quite the dramatic change, the 👿 Imp face has lost its impishness and been converted into the norm: a displeased version of 😈 Smiling Face With Horns, which itself has been changed from red to the more common purple colouring. Next, the 👾 Alien Monster is no longer a more bulbous yellow version of 👽 Alien, but now shows the purple tentacle creature (though not pixeled in a Space Invaders fashion). And, just as Samsung's dancing woman discovered the tango, 🕺 Man Dancing has now been standardised into showing off his Saturday Night Fever cosplay. 💅 Nail Polish has been reoriented for that upward-tilt sass. While 👻 Ghost is now playful and cheeky. Both the 🦊 Fox Face and 🐺 Wolf Face have been updated. The versions of ⛹️ Person Bouncing Ball is now actually bouncing their basketball, akin to other vendors. 📿 Prayer Beads no longer feature a crucifix, again akin to other vendors. The 📛 Name Badge, which in the last Samsung emoji update received three letters assumed to be initials in its central white strip, now has had those same letters removed. Similarly, initials have been removed from 📓 Notebook, 📒 Ledger and 🏷️ Label in their re-designs. 🎌 Crossed Flags, 🗾 Map of Japan and 💹 Chart Increasing With Yen have each received graphic revisions, though their continued inclusion in Samsung's emoji set is of note in and of itself. The various moon phases, such as 🌒 Waxing Crescent Moon and 🌔 Waxing Gibbous Moon, have also had their background sky imagery removed and now show the darkened parts of its surface. The Cookie Monster can rest assured that in the future he won't get mistakenly accused of making off-brand declarations of love for salted crackers. 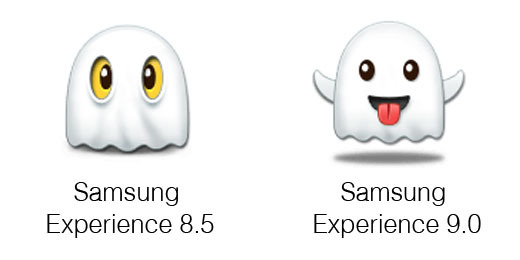 Despite the significant changes outlined above, however, there are still some emojis which remain out-of-sync with the designs seen on other major vendors. Perhaps most notable are the 👯 Women With Bunny Ears and 👯‍♂️ Men With Bunny Ears. Although they have both received a change in the colour of the tops, making them match those worn by other Samsung men and women, they remain a single person wearing white bunny ears. This them in line with Facebook, but in contrast to Apple, Google, Microsoft and Twitter. As well as this, the 🇺 Regional Indicator Symbol Letter U and 🇻 Regional Indicator Symbol Letter V remain inverted, meaning that if users happen to view one of these emojis in isolation, "U" will appear as a "V" and vice versa. 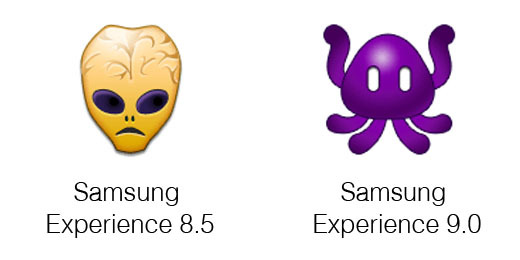 Overall, this update appears to retain a lot of the charm of Samsung's emoji set, while fixing the most egregious cross-platform compatibility issues.